Free shipping - This revolutionary Hybrid sharpener effectively combines electric and manual for honing and resharpening - without power! Easily apply razor-sharp edges with advanced Hybrid technology from Chef's Choice. 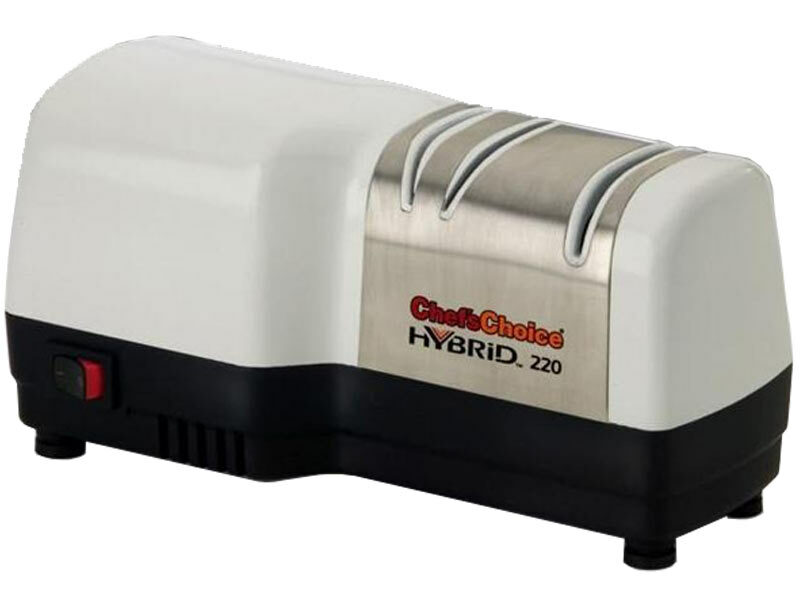 This efficient Hybrid 220 sharpener effectively combines electric and manual CrissCross advanced sharpening technology for an extremely sharp, burr-free edge with lots of bite. It's easy to use, featuring two sharpening stages that provide a strong and durable arch-shaped edge. Using Chef's Choice signature 100% diamond abrasives in both stages, Stage 1 is electric for sharpening and Stage 2 is manual for honing and resharpening - without power! Fast and easy to use, with no guesswork, the Hybrid 220 features elegant and durable brushed stainless steel knife guides. It sharpens straight and serrated edge knives, kitchen and household knives, sports knives and pocket knives. Engineered and assembled in the U.S.A. This revolutionary Hybrid sharpener effectively combines electric and manual for honing and resharpening - without power!